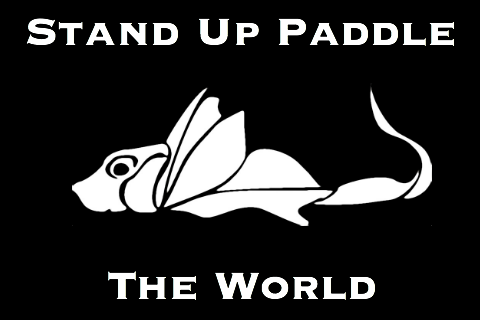 Thank you for taking a moment to explore “Stand Up Paddle The World” Check in often and say hello. Standup paddle boarding took hold of me completely about three years ago after I lost my brother in a rock climbing accident in the Red Rock Mountains of Las Vegas. He took a lot of risks and lived life to the fullest every day. As if almost a validation of his life and ultimate death doing what he loved; I used SUP to restart my life after his loss. I resurfaced from the sadness of his loss under the Golden Gate Bridge on an ebb tide into 25 mph winds on a SUP excursion that could have ended my own life by rogue waves, a shroud of fog that caught everyone in San Francisco by surprise that time of year, getting flushed out to the “Potato Patch” and getting hit by a couple of container ships on the bar under the bridge. The currents were so strong that I had to abort my trip and land at Marshal Beach avoiding rocks and waves that crash quickly on shore. I continue to take risks, preparing as best I can, and learning everything possible about each body of water. Still, every trip unlocks an unanticipated danger that somehow I managed to avoid–an open zipper on my drysuit in 28 degree water on the Great Salt Lake in February. Passing under three sharp concrete pillars, just inches from my fin and hurling me off my board into rebar and other debris–normally not a problem, but this trip was on the Hylebos Waterway, an EPA Superfund site, and just a thousand feet from the outlet of a wastewater treatment plant. Not even the smallest of cuts allowed on this trip! With that said, one of the most dangerous SUP trips of my life almost ended in a ball of flames by being rear-ended in a heavy fog on the way to my launch point–I could not see 30 feet in front of me in the fog, yet almost everyone on the road continued to pass ahead at high speed. SUP can take you there, anywhere, and you can create your own level of risk and reward on bodies of water all over the world. Some of these are in your own backyard and after paddling them, you will never see them again in the same light. Life is a dangerous sport-driving, running, riding bikes, swimming, or even being in a public place nowadays. Try to minimize your risk level, but get out there!